Poll pundits are in a dilemma of giving a clear majority to one particular party in MP, though most of them say the Congress has a marginal edge over the BJP. 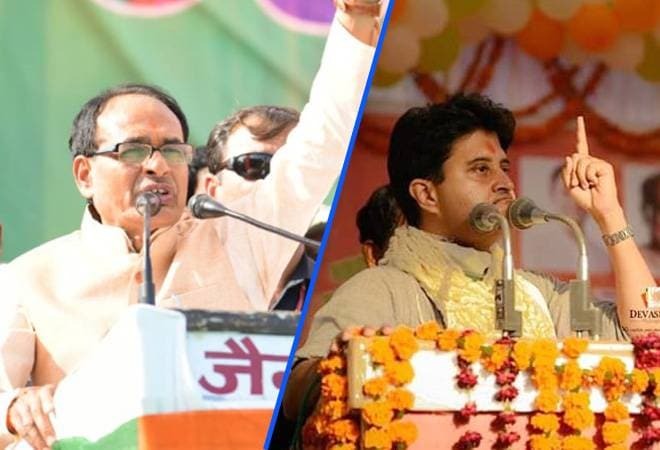 Of all the five states that went to Assembly elections, with polls in Rajasthan and Telangana having concluded on Friday, Madhya Pradesh is the state where both the Congress and the BJP are in a neck-and-neck contest. Poll pundits are in a dilemma of giving a clear majority to one particular party, though most of them say the Congress has a marginal edge over the BJP. According to the India Today-Axis My India exit polls released on Friday evening, the BJP is projected to win 102-120 seats in the 230-seat state Legislative Assembly, while the Congress may get 104-122 seats. In terms of vote share, too, the Congress seems to have an advantage over the BJP. The exit poll survey says the Congress may get 41 per cent of the votes polled while the BJP will be slightly behind with 40 per cent votes. A strong anti-incumbency wave in the state against the Shivraj Singh Chouhan government, and the exit polls showing a surge for the Congress, have given some hope of recovery for the Congress party. In the Assembly elections in 2013, the Congress had secured 58 seats only, while the BJP had won with a thumping majority of 165 seats. As per the exit polls survey, the Congress party seems to be making a recovery of as many as 54 seats in this election. The Congress seems to be ahead than the BJP in the three major regions of the state -- Chambal, Bundelkhand and Mahakoshal. Other exit poll surveys also predict a nail-biting situation for both the parties. The exit poll survey conducted by ABP says the Congress will win on 126 seats, while the BJP will be reduced to 94 seats. BSP will not be able to open its account, while others, including independents, could win on 10 seats. The survey conducted by CVoter says the Congress may win on 110-126 seats while the BJP will secure victory on 90-106 seats. Republic-Jan Ki Baat says the BJP is getting anywhere between 108-128 seats; the Congress 95-115; BSP 0; and others 7. The Times Now-CNX survey says the BJP could win in 126 seats, while the Congress will secure victory in 89 seats. BSP and others are expected to win in 6 and 9 seats, respectively.